A baby rattlesnake typically has similar markings to an adult rattlesnake but are overall darker in appearance and lack the fully developed rattle. A baby rattlesnake will have a pre-button instead of a rattle and will typically be born in July or August, making these months especially dangerous for a baby rattlesnake bite. Rattlesnakes are known for their striped appearance, venomous bite, and signature rattle on their tail. Some people claim that the bite of a baby rattlesnake is actually more dangerous than the bite of an adult rattlesnake, but this isn’t quite true. That said, while the bite of a baby rattlesnake isn’t quite as potent as the bite of an adult, it can still be quite dangerous. Baby rattlesnakes look a little different from their adult form, so it’s important to be able to tell discern a baby rattlesnake from another kind of snake. It’s important to be able to tell a rattlesnake from another kind of snake. The signature rattle sound of their tail is an obvious clue, but rattlesnakes won’t always sound their warning before striking, so it is good to be knowledgeable about other aspects of their appearance. The rattle of a rattlesnake is made out of sections of keratin, which fit inside one another loosely. When the sections of keratin knock into one another as the snake shakes its tail, the rattle sound is made. There are a variety of rattlesnakes that can be found all around North and South America. The highest concentration of rattlesnakes is in the regions of northern Mexico and the southwestern United States. Arizona has 13 distinct species of rattlesnakes, which is the highest amount of species in a single state in the entire US. Rattlesnakes can be found all over the US because they are very adaptable. Rattlesnakes can live at a variety of different elevations, in a variety of different ecosystems, being found at sea level and all the way up to around 11,000 feet (3,350 meters). Rattlesnakes can live in desert areas, amidst scrub brush, in rocky hillsides, grasslands, swamps, and meadows. While the exact characteristics of a rattlesnake will change in between the different kinds of species, there are some general characteristics they share that you can use to distinguish them. Rattlesnakes typically range from one to eight feet in length. A rattlesnake has ridged or keeled scales, unlike some other kinds of snakes which have smoother scales. The patterns that show up on the scales of rattlesnakes tend to be made out of hexagons, diamonds or rhombuses. The geometric shapes usually show up as dark patterns on top of a lighter overall backdrop. Other identifying aspects of a rattlesnake include “facial pits”, indented regions of their face that they use to sense heat. They have hinged fangs and unlike other snakes which lay eggs, some rattlesnakes have live births. These are features which are shared with other types of pit vipers. Most rattlesnakes have a triangular head and they have eyes that have vertical slits for pupils. Young rattlesnakes look a little different from their adult counterparts, so in addition to their triangular head, you should look for these other distinguishing features. The stripes of other geometrical patterns on a baby rattlesnake may not be as discernable because of the smaller body of a baby rattlesnake, but they are there. Young rattlesnakes also tend to be more slender overall than adult rattlesnakes, but their bodies still taper at both ends like the adults do. The size of a baby rattlesnake tends to be between 6 to 12 inches in length. It’s important to be able to recognize a baby rattlesnake at sight because baby rattlesnakes don’t have rattles for the first portion of their life. Rattlesnakes don’t get their rattle until the first time that they shed skin. The baby rattlesnake instead has a structure called a knob or button, a lump on its tail where the rattle would be. It is frequently claimed that the bite of a baby rattlesnake is actually more dangerous than the bite of an adult rattlesnake. This may be partially true, but only partially. Some studies have found that baby western rattlesnakes may have venom that actually has more toxic compounds drop for drop than the venom of an adult does. 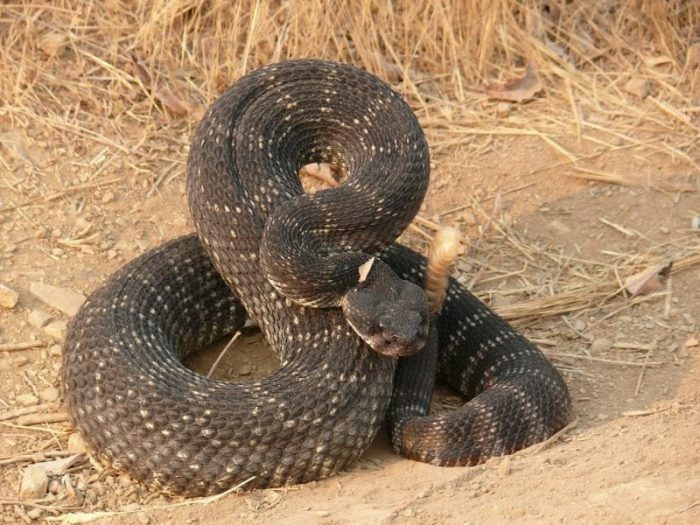 Nonetheless, the bite of a mature snake injects substantially larger doses of venom than the bite of a baby rattlesnake, meaning that adult bites tend to be more dangerous overall. Rattlesnakes primarily eat lizards and rodents. When hunting, rattlesnakes will wait perfectly still for their prey to arrive then strike extremely quickly, at a speed which takes less than half of a second to connect their fangs. The venom is used to paralyze the prey of rattlesnake, and the snake then swallows their prey whole. Baby rattlesnakes are capable of fending for themselves as soon as they are born, able to hunt and kill prey, so this evidently means that their venom is quite potent as soon as they are born. The bite of a rattlesnake is so potent because it is a deadly cocktail of different toxic chemicals. The primary ingredients in the bite of a rattlesnake are a variety of hemotoxins. Hemotoxins are toxins which impact the blood of an animal.They can damage or destroy red blood cells, impair the ability of the blood to clot, or lead to tissue or organ damage. The hemotoxins in a rattlesnake bite can lead to internal bleeding, severe pain and swelling, muscle damage, and temporary or permanent damage to tissue including the potential loss of an extremity. 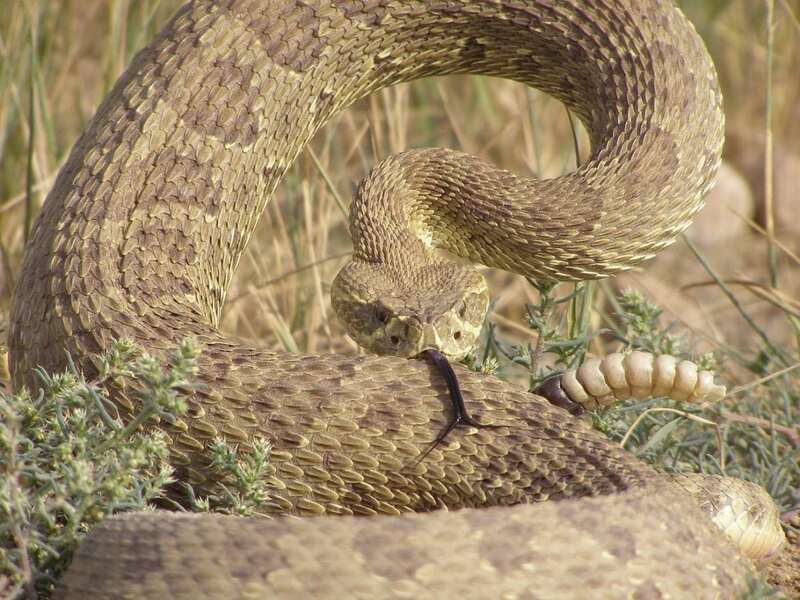 Some species of rattlesnakes also have neurotoxins packed into their bite along with the hemotoxins. Neurotoxin affects the nervous system of an animal, and they tend to act quicker than hemotoxins. A rattlesnake bite containing neurotoxins can quickly lead to dizziness, blurred vision, difficulty speaking, problems maintaining posture, and even death from respiratory failure. For these reasons, it’s important to seek medical attention immediately if bitten by a rattlesnake. Some species of rattlesnakes may actually be losing their rattles thanks to evolution. The theory goes that although the rattle of a rattlesnake is meant to serve as a warning, it has actually drawn attention from humans who often kill them. The fact that they draw attention from humans and are subsequently killed means that increasingly only the mutated rattlesnakes that are born without rattles live on and pass on their DNA. The rattlesnakes that can’t rattle are often more aggressive and harder to detect, making them more dangerous. Remember how rattlesnakes look in order to distinguish them from other snake and in order to ascertain if a baby snake is a baby rattlesnake. Seek immediate medical attention if bitten by a rattlesnake, even a baby one, as all snake bits can be dangerous.